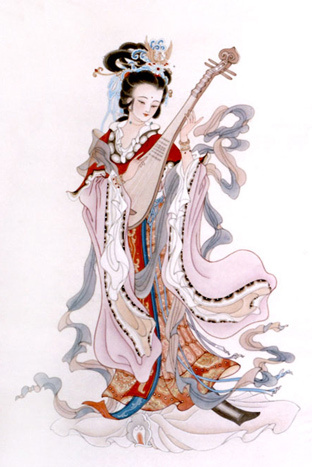 Xuan Nu deity of nourishment, vitality and health. Tai Cho kung fu of Zhu Yuanzhang 1st Ming Emperor 1368 AD also known as Ming Hong Quan 洪拳(great fist).For its powerfuland explosive techniques.It was during his time that southern martial arts developed extensively to became distinctly separate from northern martial art. Lohan boxing of Shaolin, for its flexibility, light body, hand speed and boxing techniques. 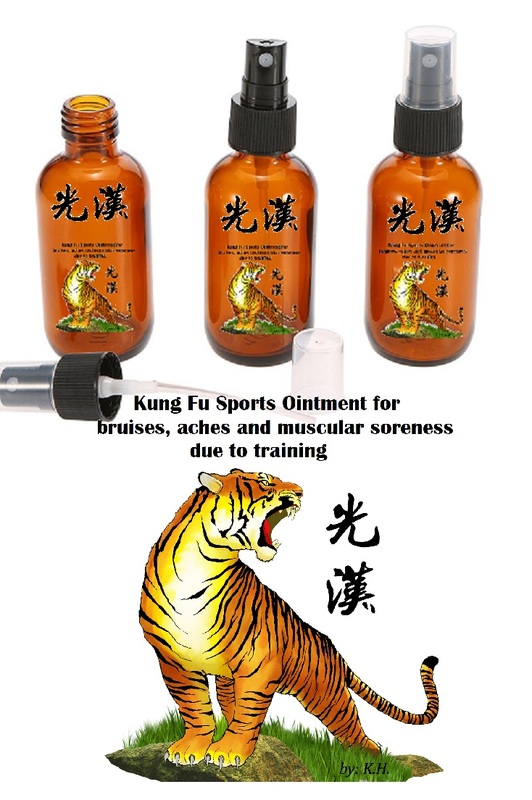 Monkey Kung Fu for its strong, sturdy footworks, that allows great mobility and desterity..
White Crane kung fu for its refine deadly techniques of accuracy targeting vital and soft spots of the human body. Da Mo Kung Fu for its meditation and breathing "qi gong" exercise technique to strengthen internal organs, enhance energy and vitality. 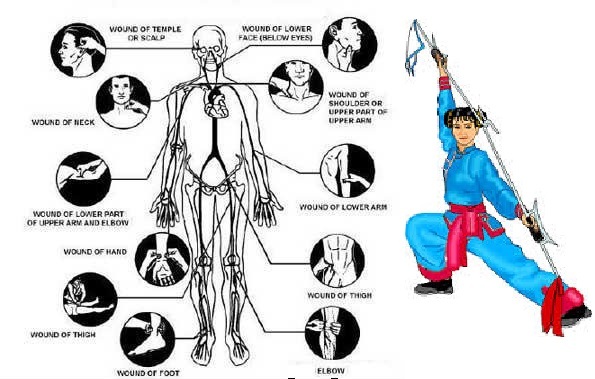 Xuan Nu the female martial artist master of the dim mack pressure point technique. 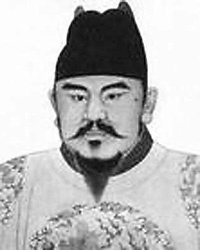 To understand the origin of Ngo Cho Kun one has to go back to the time of the 1st Ming Emperor Zhu Yuanzhang (Chu Yuan-chang) 朱元璋 he was a great warrior that led a rebellion against the Mongols (Yuan dynasty) defeating the Mongols he established the Ming dynasty in 1369. It was during the Ming dynasty that southern martial art specifically in Fujian province will expand to new level and history. The Tai Cho martial art system that was developed during the Song dynasty 960 -1279 AD by the Song emperor Zhao Kuangyin 趙匡胤, he was known to be a great martial artist will become a reputable martial art style representing the martial and imperial prowess of the emperor’s dynasty its formation and formulation an amalgamation of all the best known martial kung fu that existed during that time the Tai Cho system of the Emperor Song consisted mainly of known northern kung fu styles. When the Mongols invaded and conquered China establishing the Yuan dynasty in 1279 the Song Tai Zu martial art would go underground and will find its way to south China. In 1368 China will be liberated from the Mongols by Zhu Yuanzhang( Chu Yuan Chang) 朱元璋 he will establish the Ming dynasty, Tai Zu martial art system will evolved to represent this liberation and to honor the Ming dynasty, Tai Zu martial system was reintroduced with modified, expanded new fighting techniques that emphasized more on short range, heavy conditioning application of fighting skills for the battlefield, development and utilization of powerful and explosive techniques it would become known as Ming Hung Quan 明洪拳 (Ming Great Fist). 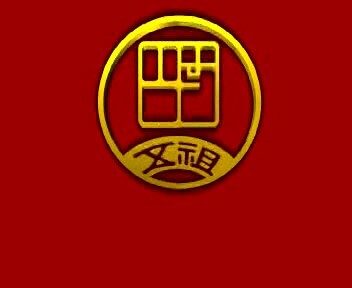 At the same time the Song Tai Zu martial art system will continue to exist and would be known as太祖长拳 “Tai Zu Chang Chuan” (emperor long fist). The Song Tai Zu and Ming Tai Zu will separately have their own history and martial development independent from each other this difference is clearly evident to this day. 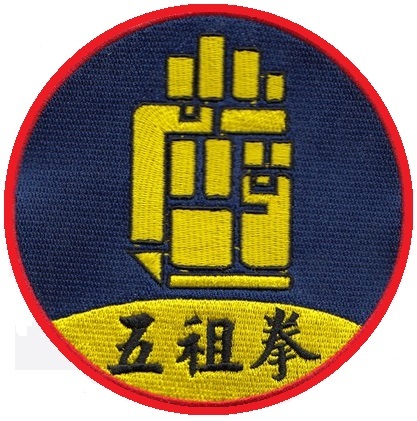 The Ming Hung Tai Zu martial art system would expand mostly in the south especially in Fujian province in 1644 when the Manchurians invaded and conquered China replacing the Ming with the Qing dynasty the training in Ming Tai Zu martial art will intensify in Fujian province as they get ready to resist the Qing. The last Ming official to militarily resist the Qing was Admiral Zheng Cheng Gong 鄭成功, in the west he is known as Koxinga. Admiral Zheng Cheng Gong the last Ming official to militarily resist the Qing forces. Admiral Zheng would expel the Dutch from Taiwan and establish a strong naval base with his naval superiority Admiral Zheng would be successful in holding off the Qing army advances towards Quanzhou, Xiamen and Taiwan. His death in 1661 of malaria would proof to be very costly to the Ming forces, the Ming forces would soon be forced to surrender to the Qing others would continue to resist forming secret societies to undermine and plot against the Qing the death of Admiral Zheng would mark the total end of the Ming dynasty. Ming Hung Tai Zu would continue to be practiced as a symbol of resistance to the Qing with the hope for the restoration of the Ming dynasty or the liberation of China from the foreign rule of the Qing. In 1911 the secret societies will succeed in over throwing the Qing and establish a modern China led by Dr. Sun Yet Sen 孫逸仙base on the three principle San Min Zhu Yi 三民主義 they are: 1. 民族主義 Minzu meaning Nationalism a government for the people of the people. 2. 民權主義, Mingquan meaning Democracy a free government elected by the people a government with check and balance between the legislative, judiciary and executive branches of government and 3. 民生主義 Minsheng meaning Social Justice education, jobs, land reform and right to private ownership and commerce. After the Qing have fully conquered northern China in 1644 many Ming loyalists, family members and military officials retreated to the south some will seek refuge inside the south Shaolin and other Buddhist and Taoist temples in Quanzhou and other parts of Fujian, they started to train in martial arts and will use those temples as a base to conduct anti Qing movements. In the south resistance against the Qing will be intense it was during this time that southern martial arts expanded mainly to train the southerners to fight off the Qing invaders and try to restore the Ming dynasty back to power the famous slogan would be反清复明, fan Qing, fu Ming “destroy the Qing restore the Ming”. In 1734 the Qing decided to attack and destroy the Shaolin temple killing almost all of the inhabitants in the monastery, although there were other temples that were sheltering rebels and teaching martial art Shaolin temple was single out mainly because of the large number of rebels in the temple and Shaolin’s history allying with the Ming plus the Qing wanting to use the destruction of the Shaolin temple as an example to all other temples if they continue to resist they will be destroy as well. Buddhism a religious belief that teaches enlightenment is the gateway to escape life’s suffering. Ancestral veneration-worshipping a religious practice that venerates dead loved ones or individuals that have live an exemplary life praying to their spirits to grant the living better or protected life. Emperor veneration-worshipping a religious belief that an emperor has the Mandate from Heaven a representative of sort from god or gods a demi-god and the emperor’s edict are sacred. Yong Chun White Crane created sometime in the 1700’s with its precise and whipping fighting techniques. Monkey Fist, for its agility, dexterity and cunning in battle. Shaolin boxing for its flexibility, speed and spiritual enlightenment. Da Mo and Taoist internal breathing, meditation exercises. Tai Cho Kun in recognition of the Song and Ming dynasty and the martial of it which is an amalgamation of all Chinese martial arts. 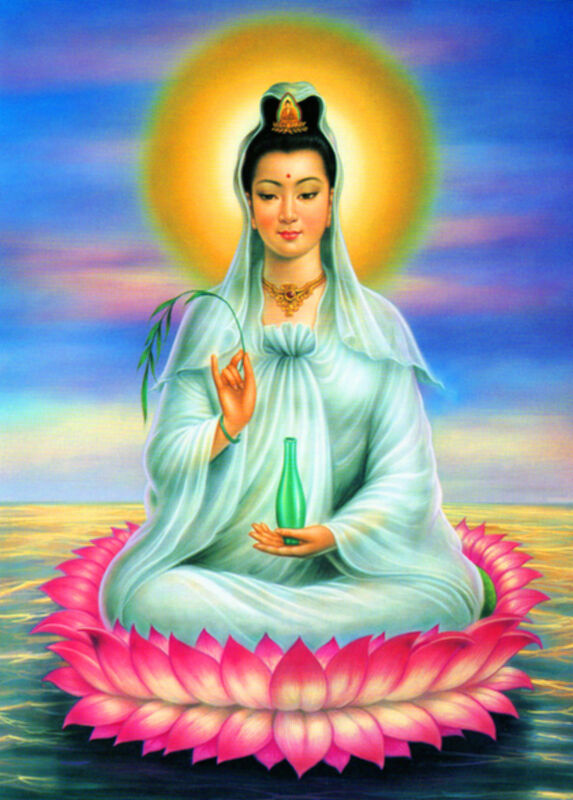 Xuan Nu in recognition of pressure point, traditional medicine and healing aspect that is attributed to a forgotten lady master known to be an expert in this field. 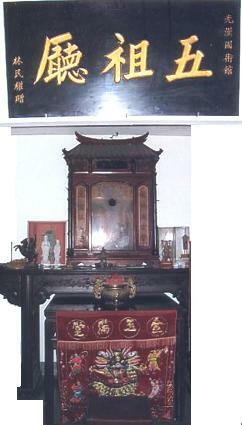 Altar of the Five Ancestors at Kong Han Martial Art Club in Manila Philippines. As Tai Cho martial art started to spread to the general population the Qing made sure that all martial art schools will be strictly regulated. 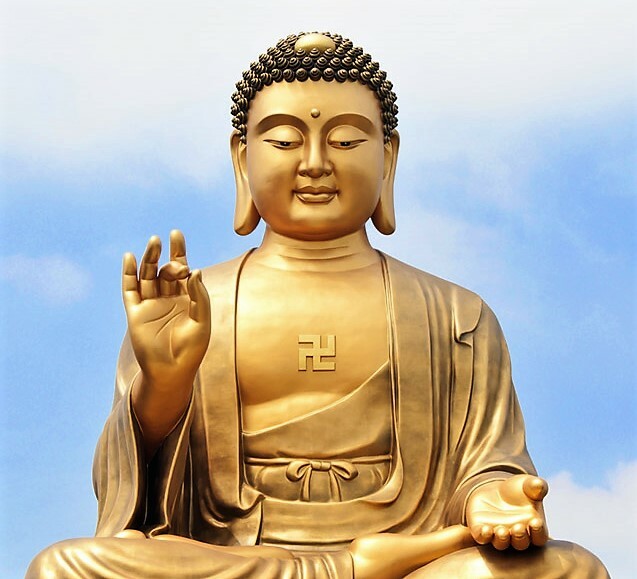 In order to escaped the prying eyes of the Qing, from getting shut down or attacked by the Qing army, many martial art schools started to hide their anti-Qing sentiments and started to develop coded hand signals and symbolism that only fellow patriots will be able to decipher. One of the hand codes is the hand salute, the right back fist resting on the hand of the left palm. Another part of Goh Cho Kun history is the green lion青狮 ritual which was adopted from the southern Taizuquan martial art tradition, unlike all other lion dances, the green lion is neither a dance nor a ceremonial lion it is a ritual, the green lion with its fierce face and sharp saber tooth symbolizes the Qing dynasty清朝 for their brutality and harsh rule, the color green of the lion is because the word green in Fujian dialect minnan hua 閩南語 is pronounce as “tsi” which sound the same as Qing or Ching thus camouflaging the real representation of the green lion also the green representing the Qing’s Green Standard Army “Lüying 綠營” which are deployed in local civilian population acting as constabulary to enforce Qing laws, quell small scale disturbances and minor rebellion. 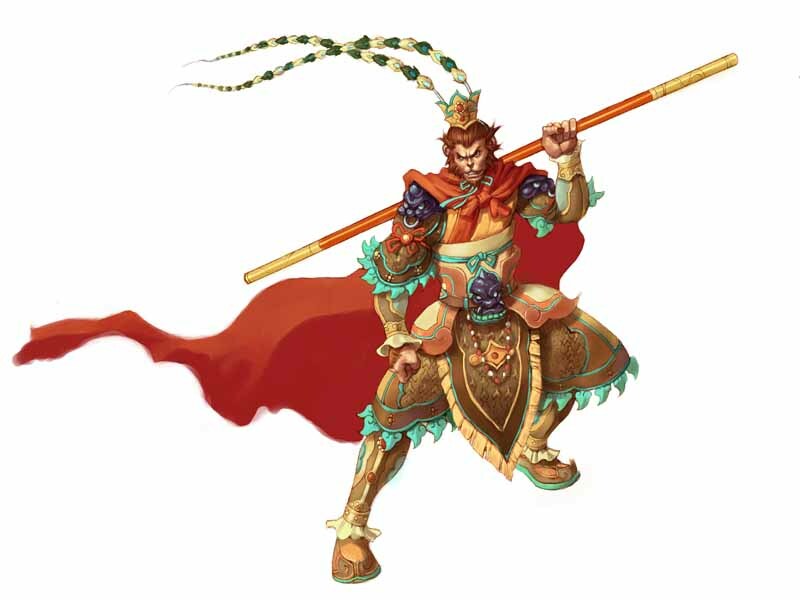 The Ngo Cho Kun warrior that fights the green lion with a martial art weapon symbolizes and reminds them of the struggle of the Han people for freedom. The green lion ritual ends with the green lion being slain that is why up to this day it is very rare to see the green lion performing in ceremonial festivities such as weddings or birthdays. 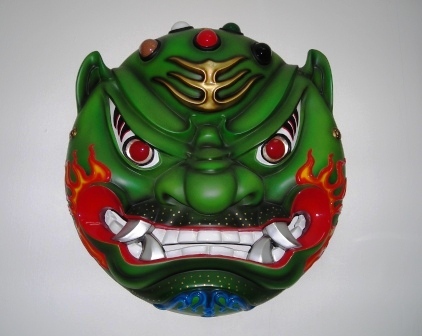 After the fall of the Qing dynasty in 1911, the Fighting Green Lion became a representation of freedom and prosperity. Green represents auspiciousness and prosperity, the white eyebrow represents wisdom and justice, the white fang represents courage and patriotism, the fierce face fight against evil or is to scare away evil and red for long life. Today, the green lion no longer represent any form of political or social rebellion; it now represents hope, peace, and unity it is slowly being introduced in festivals and special events as a ceremonial lion. Taizuquan sometime in the 1700s would become the mainstream martial art in Fujian China with many followers in Zhangzhou, Quanzhou and Xiamen. One of the first well known southern Tai Zu martial art master was Wu Xin (悟心, 1691-1758) it is said that he studied Tai Zu from a former Ming royal family member who in order to escape the Qing authorities converted to become a monk, both of them reside in Dongchan Temple in Quanzhou (东禅寺, Eastern Zen Temple) and it is in this temple that Wu Xin will become an expert Tai Zu master and teach it to many lay people. Later in the 1880’s two great masters Chua Giok Beng and Li Junren will introduced their version of Goh Cho Kun which will be based on five kung fu styles for Chua Giok Beng it will be the combination of the Song-Tai Cho Kun (long fist), Monkey Fist. Lo Han, White Crane and Da Mo Chua’s version of Ngo Cho Kun will be known as Ngo Cho Kun Ho Yang Pai. 五祖拳何阳派. And Li Junren’s version will be known as Yong Chun-Ngo Cho Kun 永春五祖拳 his Ngo Cho Kun will be based on the combination of Ming Tai Cho Kun, Monkey Fist, Yong Chun White Crane, Lo Han boxing-Da Mo and Xuan Nu. Thus the origin of Goh Cho Kun was started by a group of Tai Cho Masters all of their core development were based on the history and legacy of the Ming dynasty and was developed during the Qing dynasty all followed the concept of the Sam Chien and the Green Lion representation. Because of this very closed and shared history all Goh Cho Kun will be interrelated and interchangeable and will have heavy influences upon each other. Ho Yang Pai Ngo Cho Kun will have strong presence at Quanzhou, Yong Chun Goh Cho Kun will have strong presence at Yong Chun. Both Chua Giok Beng and Li Junren are known to have been very close friends sharing several theories and research in the formulation of their respective Goh Cho Kun. Many Tai Cho martial artist will join either Chua's Ho Yang Pai or Li's Yong Chun NCK while others who did not will remain Tai Cho Goh Cho Kun. Kong Han Martial Art Club founded by Dr. Lo Yan Chiu its martial art kung fu lineage is base on the Tai Cho-Goh Cho Kun history. Was originally from Yongding, Fujian province he would later opened a small Inn within the Yingzhou district of Yingzhou. It is believe that his martial art back ground is both norther and southern Tai Cho Kun. In the later Qianlong period he would later taught martial arts in Zhangzhou (where the martial hall is known as 'Heyang Tang'). His martial arts were renowned for hard power often described as 'jing gang jing' (Diamond hard power). The Taizu Quan style is also sometimes known as Heyang Quan by latter practitioners. One of his outstanding students is Cai Yuming (Chua Giok Beng 蔡玉鳴1853 -1910) he will expand and introduce his version of Ngo Cho Kun into what will be known as Ngo Cho Kun-Ho Yang Pai. Was born in Quanzhou he started at age 14 studying martial arts with Master Zhuang Dan (庄胆), and then he became a disciple of Kong Po Chiam (公婆詹), of the Tai Cho / Ngo Cho Kun style. He also met and interacted with the famous Sijo Chua Giok Beng and his disciples Master Lim Kui Lu (林九如), Chen Qingming, Tan Kiong Beng and others thus expanding his skills, abilities and knowledge in ngo cho kun. After only 5 years of intense training, Lo Yan Chiu opened his school in 1897 at Wei Tou village, instructing in Ngo Cho Kun and offering medical services. In 1899, he traveled overseas over nine years to countries including Burma (Myanmar), Malaysia, Indonesia, Hong Kong, Vietnam and Singapore. He gained great experience and in 1909 returned to Quanzhou. During the turbulent years of 1910-1912, Lo Yan Chiu was involved in the nationalist movement having served as combat instructor and medical officer of the 183rd Div. 19th Route Nationalist Army. In 1936, the Sino-Japanese war commenced and by urging of his students given his advanced age and his involvement against Japan he relocated to Manila. At present the legacy of Dr. Lo Yan Chiu and Kong Han Athletic Club is under the leadership of his grandson Headmaster Lo Si Beng 盧思明 (Henry Lo) with instructors in the Philippines, Canada, USA, Brazil, Australia and Norway. Chua combined the best of the existing five famous styles of kung-fu from Fukien at that time into a composite style. It was therefore made up of the following styles: peho (white crane), Tai Cho (Sung dynasty emperor boxing), lohan (Buddhist arhat methods), kao kun (monkey), and tat chun (Bodhidharma’s method). 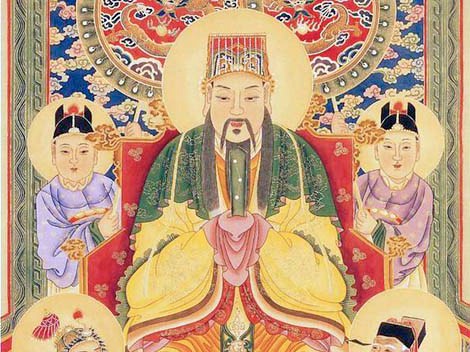 Chua called his style ngo cho kun, or “fist of the five ancestors,” in honor of the five styles he combined. One of the well known temple in Quanzhou that has a record of teaching Tai Zu Quan is the Dong Chan Temple (东禅寺, Eastern Zen Temple) according to their records Li Junren李俊仁 (1849 -1933) started training in martial art at Dongchan Temple 东禅寺 Quanzhou Fujian China in the southern Ming Tai Zu martial art style that was expanded by Grandmaster Wu Xin 悟心 in the 1700s. Li Junren would excel in his martial arts and after spending years training he decided to return to his hometown in Yong Chun, Fujian, home of the Fujian-White Crane martial art system. Upon reaching home he continue to train hard until finally he decided to formulate a system that would combine these five martial arts system into one they are (1) Fujian-White crane (2) Monkey fist (3) southern-Tai Zu (4) Lo Han-Da Mo (5) Xuan Nu it would be called or refer to as Yong Chun-Ngo Cho Kun永春五祖拳, Yong Chun was the home town of Li Junren where he develop his version of Ngo Cho Kun. Li Junren will pass his lineage to his nephew Kan Teck Guan and in the mid 1900s Master Kan will establish schools in Singapore and Malaysia. was born in Yongchun county, Fujian province. He was an expert of both martial arts and medicine. His martial arts were studied from his uncle (aunty's husband) Li Junren (李俊仁) who had practiced from the Chua Giok Beng line as well as from the martial arts descendant from Wu Xin (悟心) who taught Tai cho martial arts at the Dongchan temple (东禅寺) in the 1730's. In the early 1900's he moved to Singapore and established a hall for the practice of medicine and teaching of martial arts in 1916. Later he opened other schools in Kuala Lumpur (1918) and Malacca (1927) his children will inherit his legacy the Zhonghua Martial Arts Athletic Association establish by his children in 1988 and today the Zhonghua Sports Club located in Chinatown, Singapore. One of the Ten Tigers of Chua Giok Beng, Master Tan Kiong Beng is famous for his iron palm technique in 1918 he will visit Manila as a healer and in 1935 he will assign his son the young Master Tan Ka Hong to open and operate a Ngo Cho Kun training center in Manila, Philippines. Master Tan Ka Hong (1914 -1990) and associates will name their school Beng Kiam Athletic Club in memory of their Grandmaster Chua Giok Beng. Tan Kiong Beng was also once a martial classmate of Lo Yan Chiu both trained under Master Kong Po Chiam before Tan Kiong Beng join Chua Giok Beng and became his disciple. Master Sim was the last indoor disciple of Sijo Chua Giok Beng. Master Sim in the 1930s will expand Ngo Cho Kun to Singapore, Indonesia, Myanmar (Burma), Quanzhou and Xiamen His Wuzuquan will have strong emphasis on the Pek Hok (White Crane) of Yong Chun system. Lo Ban Teng moved to Indonesia where he practiced medicine and taught martial arts. He was known not only for his medical skills but for his martial physical strength and his direct, honest and hard to everyone equalitarian character. Lo Ban Teng was the most influential figure in establishing Chua Giok Beng-Wuzuquan in Indonesia. One prime emphasis of his lineage is to breathe right to develop a hard blow as well as the ability to bear the hard blow of an opponent. During his whole life Lo deepened his martial arts by watching attack and defense behaviors of domestic animals, such as roosters, in fights. The adapted movements include shouting, shuddering of the body in delivering blow, and tensing the body in receiving blow. In fact, one of his favorite techniques was “Hen Flapping Her Wing ( Kee Bo Ceng Sit)” in which an incoming punch is simultaneously countered by disjointing the attacker’s elbow. Lo Ban Teng will pass his skills and legacy to Lim Tjoei Kang (林粹刚 1896-1966 fk Lin Cuigang) and Kwik Tjong Thay (郭种泰 1916 -2001, Guo Zhongtai) Lim Tjoie Kang was a student and a nephew of Lo Ban Teng and an adopted son of Sim Yong Tik. At present the Lo Ban Teng Wuzuquan is still being taught in Indonesia by several disciples and has branch out to Germany and USA. Bai Yufeng was a 14th century famous northern Shaolin martial art master according to an article written by Dr Yang, Jwing-Ming is that base on northern Shaolin records, Bai Yufeng was a Shaolin master who adapted the Shaolin name Qiu Yue Chan Shi he will combine the Five Animal system into one (1) Tiger (2) Crane (3) Snake (4) leopard and (5) Dragon they will be called Wu Xing Quan 五形拳. According to the book Shaolin Temple Record, he developed the then existing 18 Buddha Hands techniques into 173 techniques. Not only that, he compiled the existing techniques contained within Shaolin and wrote the book, The Essence of Five Fist無極五拳. This book included and discussed the practice methods and applications of the Five Fist (Animal) Patterns also known as Wu Quan 五拳. It will be no surprise that during the fall of the Ming dynasty many followers and descendants of Bai Yi Feng will follow the immigration together with many of Ming loyalist to South China in the 17th century that would eventually affect their martial art system getting influence and adapting to southern system that include incorporate Yong Chun White Crane, Southern Tai Cho and Southern Lo Han from Five Animal Fist to Five Ancestors Fist. In the early 1960s the late Grandmaster Chee Kim Thong from Malaysia, after his good friend and disciple Grandmaster Yap Ching Hai convince him to publicly reveal his Ngo Cho Kun system that is descended from the Bai Yufeng lineage GM Chee will agree and start to teach it to the general public. Presently the Chee Kim Thong Pugilistic Society with headquarters’ in Malaysia is the only known descendant of the Bai Yufeng-Ngo Cho Kun. 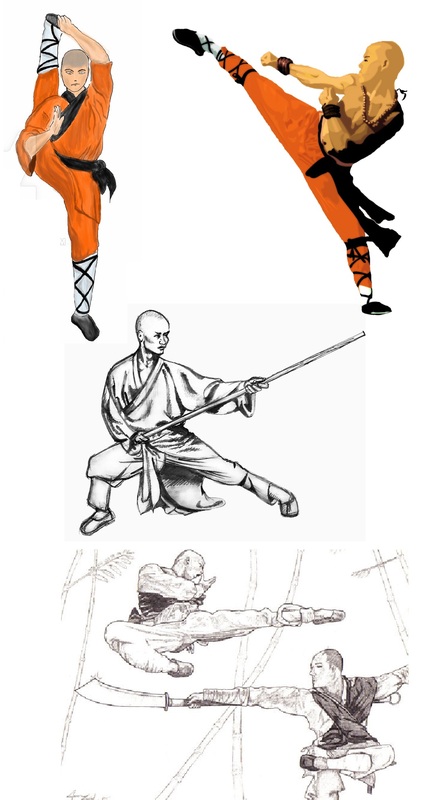 Just like there exist the northern Shaolin and southern Shaolin, a northern Martial Art and southern Martial Art each distinctly having their own history, in Ngo Cho Kun it will be the same the existence of a northern and southern Ngo Cho Kun. The Bai Yufeng-Ngo Cho Kun existence in Fujian was so secretive that the only known existing grandmaster was GM Lin Xian who according to the writings of the CKT Society, was that GM Lin Xian taught the late GM Chee Kim Thong sometime in the 1930s their system of Wuzuquan; in fact GM Chee Kim Thong would be his only known student and inheritor of what is to be Bai Yufeng-Wuzuquan. 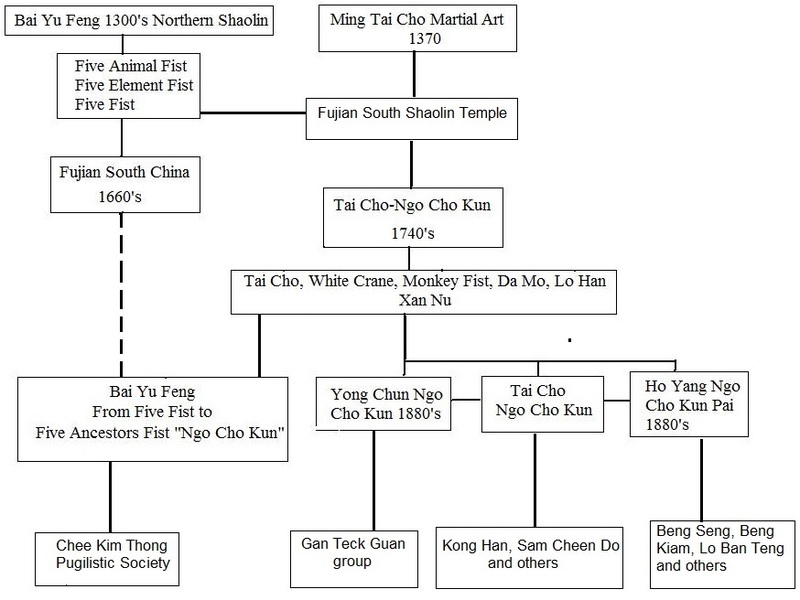 From 1880 – 1960 the Ngo Cho Kun Ho Yang, Tai Cho-Ngo Cho Kun and Yong Chun-Ngo Cho Kun were the only known Ngo Cho Kun in the Fujian Martial Art community, in the early 1960s the Bai Yufeng-Wuzuquan lineage that was revealed through the efforts of the late GM Chee Kim Thong of Malaysia who has kept their lineage secret for decades will be accepted as another part of the Ngo Cho Kun history. All these four are express also as Goh Cho Kun 五祖拳. Goh Cho Kun will have a significant influence also in the development of Japanese martial arts most notably Okinawa karate. 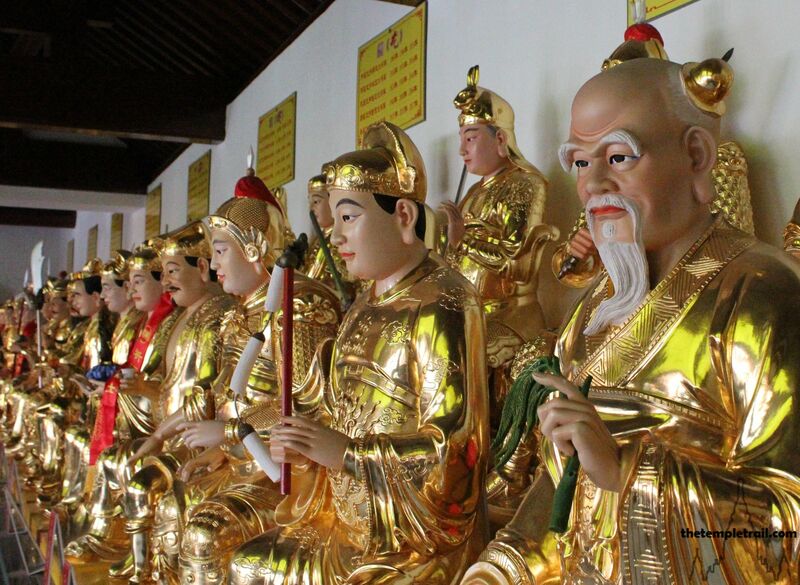 The legacy of Ngo Cho Kun has now expanded world wide with schools in Europe, North America, South America and Asia, epitomized and unified under the International South Shaolin Wuzuquan Federation headquarter at Quanzhou, Fujian China. The late Grandmaster Dr. Lo King Hui "Essentials of Ngo Cho Kun"
Master Zhou Kun Ming "History of Ngo Cho Kun"
Taiping Research Institute "History of Tai Zu and Wu Zu Quan"